Former Sharks pivot came to the club from Woy Woy on the Central Coast. Monie was named Cronulla's Player of the Year in 1969 but left the club to join Newcastle Wests before returning to Woy Woy as captain-coach. Monie went on to become a world-class coach after taking over from Jack Gibson at P’matta in 1984. After three seasons with the club, he broke through for a win in the 1986 grand final. Monie's remaining three seasons with the Eels saw the club in decline but he showed what he could do with a champion side as coach of Wigan in the early 1990s. 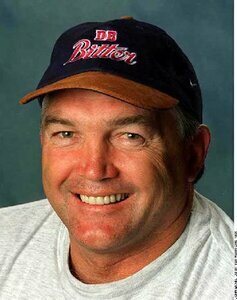 English Coach of the Year in 1989-90, Wigan was virtually unbeatable under his guidance, winning the Challenge Cup/League Championship double in successive years. 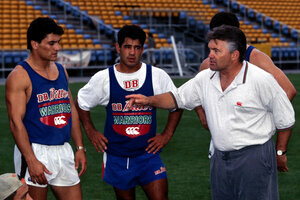 Wigan also defeated Penrith to claim world championship status in 1991 but was beaten by Brisbane the following year. Monie then took on the coaching role of the newly formed Auckland Warriors and was one of Super League’s star signings in early 1995. After a frustrating teething period with the club, Monie was sacked early in the 1997 season when he lost the confidence of his players and the support of the club’s administrators. His move to the London Broncos met a similar fate in August 2000.